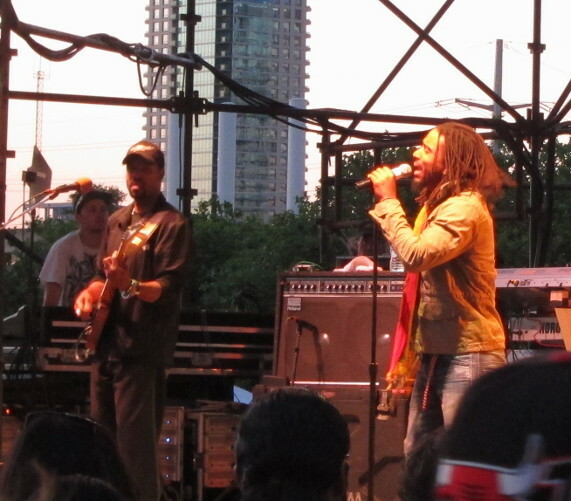 Guitarist Audley Chisholm, left, and singer Duane Anglin of The Wailers Band, playing at Austin’s Reggae Festival. That jaunt was solely to see The Wailers, the backing band that performed behind the great Bob Marley back in the day. Now this is not the original Wailers, who included Bunny Livingston (Wailer) and Peter Tosh, but a representation of the lineup that performed as Bob Marley and the Wailers from 1974 until Marley’s death in 1981. We all love us some Bob Marley. I say a “representation” because The Wailers are now led by Aston “Family Man” Barrett, the sole original member remaining, on bass. Duane Anglin has been the band’s lead singer since the beginning of this year. This was one funky jammin’ reggae party, with classic Marley tunes like “Jammin’,” “One Love/People Get Ready,” “Rastaman Vibration” and of course, “Three Little Birds,” which is one of the best-known reggae songs of all time. Singer Anglin (“Danglin”) is more than up to the task of carrying Marley’s torch, he offered some nice vocals on “Ride Natty Ride” and a nicely stoned version of Marley’s “I Shot The Sheriff.” At one point in the show Anglin announced from the stage that the second suspect in the Boston Marathon bombings had been apprehended, adding “Send Jah praises,” in relief that no more lives were taken. 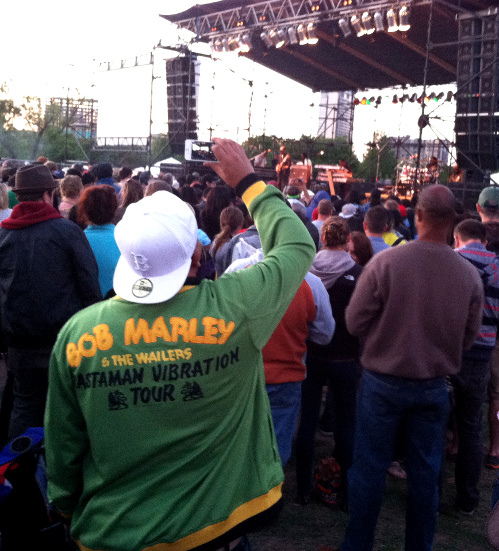 The festival continued for two more days, but we opted for only the Wailers experience. The Wailers themselves turned up in Houston two nights later to play at our excellent International Festival, and we chose not to go to that either. Instead, we enjoyed the buzz from Friday’s sparkling set by riding around sunny Austin on Saturday with the car windows down, and Maestro Marley himself in the CD player. Beautiful. We’re still focusing on our day jobs, so our posts will be rather infrequent for the next week or so. Want to quickly remind you about Record Store Day, coming up this Saturday. Make sure you go out to your friendly neighborhood record store, and at the very least, tell them thanks for hanging in there. Thanks to tyrant2525 for loan of the video. Ana Popovic is a Serbian blues guitarist and singer, and she’s releasing her sixth studio album, Can You Stand The Heat, on April 16. Many blues aficionados consider her one of the better blues guitarists around, and her last album Unconditional is still one of the best-selling blues albums ever. Here’s “Can’t You See What You’re Doing To Me,” from the new album. You are currently browsing the archives for the Rock Moment category.